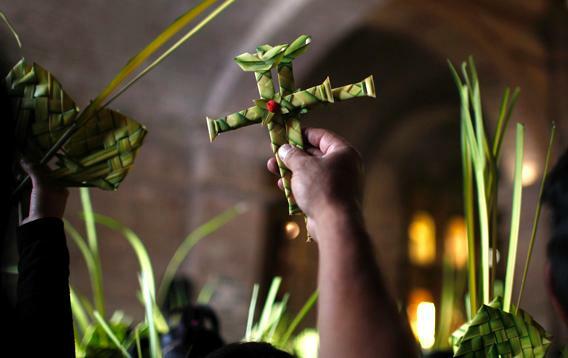 Palm Sunday is the day when all of the stories and the miracles begin to point in one focused, clear, direction, Jesus to Jerusalem, and then Jesus to the cross. The movement of the story has brought us to the gates of the city of which Jesus will not leave until his ascension. Roots of the story stretch back decades earlier, as the people yell, “Blessed is the king who comes in the name of the Lord. Peace in heaven, and glory in the highest heaven.” We are reminded of the chorus of heavenly angels that escorted Jesus into this world and announced his arrival saying, “Glory to God in the highest heaven, and on earth, peace, goodwill among the people.” Jesus is arriving to his death with the same purpose that he arrived in this life, to bring peace, salvation and life for us all. Peace is a funny thing. As we follow Jesus from the top of his donkey into Jerusalem, peace doesn’t seem to be what he stirs up. In fact, Jesus begins to agitate a lot of the tension and friction that is already vibrating in the city as soon as he arrives. The festival of Passover is just around the corner. The city is filling with pilgrims and vendors and the Romans respond with more Soldiers, more Swords, and more rules. The faithful and the political are gathering from all over the countryside to worship and remember liberation and God’s deliverance of His people from the hands of an oppressive empire. Imagine the irony and the tension as the crowds of Jewish faithful celebrate their deliverance while still staring down the point of a Roman short sword. “Remember, don’t celebrate your freedom, too freely now.” Jesus doesn’t bring peace into this already heated tension. His followers steal a donkey, though they insist it’s for a good cause. His disciples stir up the crowd with revolutionary and bombastic chants. Even, if we read ahead to the end of the chapter, the first thing Jesus once he arrives in the city is overthrow all the tables and cages in the temple and drive out the money changers. Peace on earth indeed. We are the voice of what God has done in the world. Speaking not only of how God has changed something within us, but that even now when we could be facing the worst week of our lives, we are the ones with the voice and the purpose to declare that we are at peace because we are free even in the face of circumstances that demand otherwise. The empire has no power over us anymore. As the season of Lent draws to a close, we are at the gate of the city of Jerusalem, a city that kills the prophets, and we still have a voice of hope. We are the broken and bent ones who surround Jesus as he nears the city and declare that peace and hope have comes into the world. We announce the arrival and the freedom of God, even when it’s hard to feel free. What has God done for you? What is your story that you declare with the way you lives your life. What is worth waving your palm and laying down your coat? What is your story of when God set you free? Maybe it’s still unfolding and you’re willing to walk a ways to see where this road ends up. I believe a walk with God ends in peace and hope and that’s a gift and story worth sharing. Tell someone this week about how far you’ve come. Share your story this week with a friend, a spouse, or a child and tell them that there’s hope in life even in the midst of chaos and violence. If we don’t do it, the rocks will have to do it for us and surely we can shout louder than a rock.